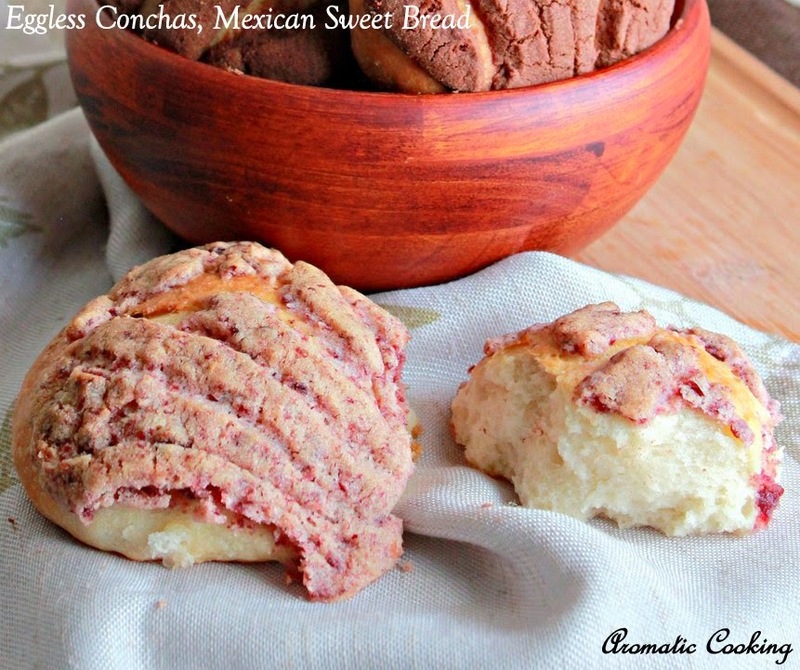 This month, for the Eggless Baking Challenge, Gayathri had chosen these lovely Conchas, Mexican Sweet Bread ( Pan Dulce ) Or Rolls. 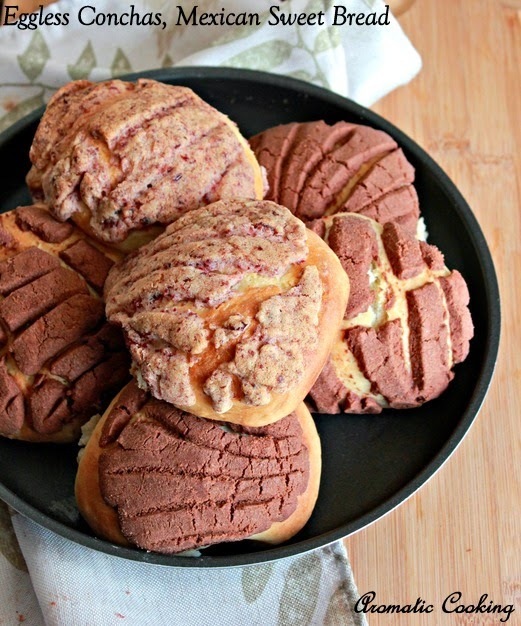 The name ' Conchas ' is because of the appearance, they look like sea shells, it's basically bread rolls, covered with sweet, buttery dough on the top, which is marked with lines, to make it look like shells. The sweet coating can be plain sugary dough or chocolate, can be colorful, using food colors or as in the recipe, using natural dried fruits which gives a nice color, flavor and taste to it. The original recipe uses about 5 eggs and gives you 16 conchas, I have halved the quantity and made 8 conchas and I have used just curd/ yogurt as the egg replacer. 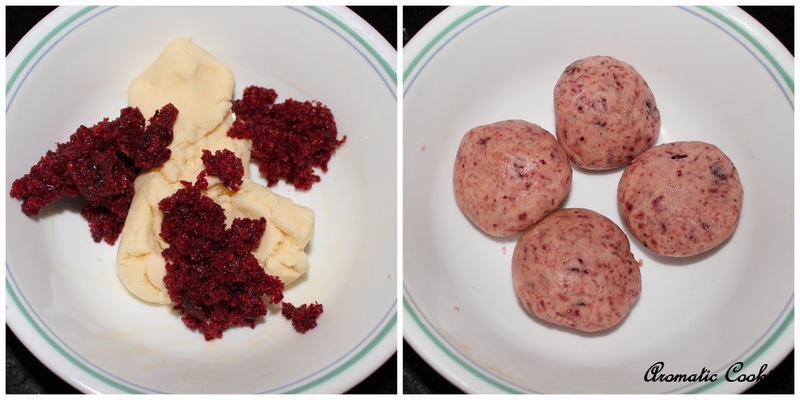 I have used cocoa powder on 4 of the shells and dried cranberries on the other 4, we liked the cranberry topped conchas more than the chocolate ones, the reason being, the dried cranberries has some sugar in it, which made the sweet topping a little more sweeter and not too dry. Next time, when I use cocoa powder, I am going to add another teaspoon of sugar, which would make the dough easy to spread and also make it more tastier and also I am going to try with the other dried fruits like blueberries, raspberries or even with dried pineappple, mangoes too..
Add the warm water to the sugar and yeast and leave it to foam up. Take the flour, curd, foamed up yeast and make a dough, leave it covered for about 2 hours, till the dough doubles up in volume, this is the sponge. Take all the ingredients given under ' Final dough ' along with the 'sponge' and mix every thing together and knead to get a sticky dough. Leave it covered for 30 minutes, then put it in the fridge for 8 to 16 hours ( I had left the dough at 11 in the night and took it out at about 9, the next morning ). 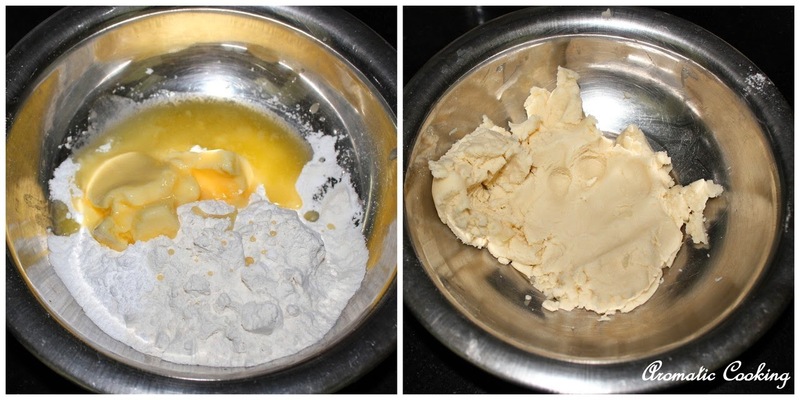 To prepare the topping, mix the butter ( room temperature ), 1/4 cup sugar and flour together to make a smooth paste. 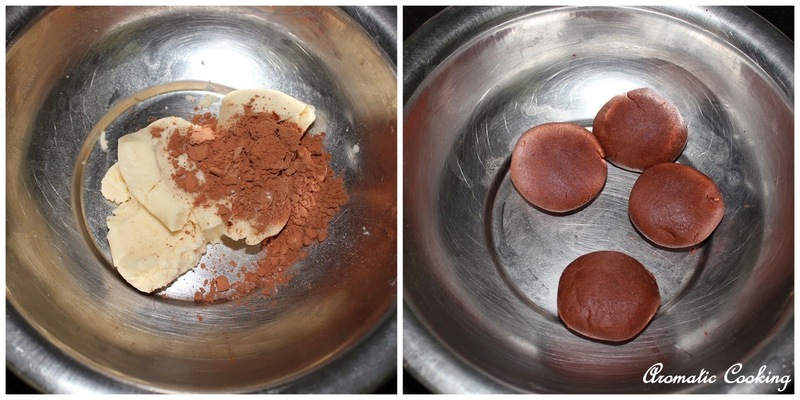 Divide the paste into half, to the first half, add the cocoa powder, mix well divide into 4 parts and keep. Grind the cranberries with the 1/2 teaspoon sugar, add this to the second half of the topping, mix well, divide into 4 parts and keep. Now take the final dough, divide into 8 parts, take one, make a smooth ball, take one of the topping ball, press it into a disc and press it over the dough ball. Place it in the baking pan ( lined with parchment paper ) and press it slightly, then using a knife, mark the lines. Do the same with all the dough balls. Leave the baking pan, uncovered for about 3 hours, the dough would have increased in volume, then bake it at 190 C for 20 to 25 mins, till the bottom of the rolls are slightly browned or golden and the topping is set. Cool and serve. If you can't find any of the berries, you can use even raisins, it should taste good. Oven timings vary, so keep an eye on it after 20 minutes. In the original recipe, all the ingredients were given in grams, I don't have a kitchen scale, so I have converted everything into cups, tablespoons and teaspoons. I had initially planned to add about 1 teaspoon of baking powder to the final dough, but I forgot, but still the rolls turned out soft. If you want, you can add it. 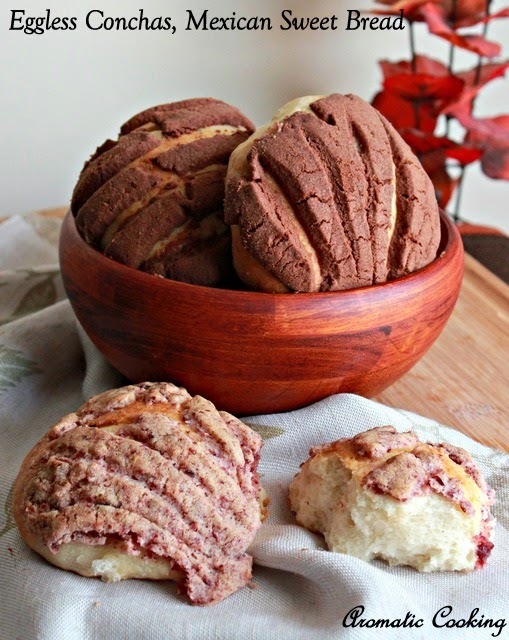 The topping would crack up, as the dough doubles up and expands, that's characteristic of conchas. Sending it to the ' Come, Join Us For Breakfast ' event at Cooking 4 All Seasons. Wow, conchas came out extremely prefect, love that cranberries toppings..
Awesum conchas......... Looks too gud!